George Graham reviews Tedeschi Trucks Band's "Let Me Get By"
Last week we talked about an apparent trend of increasing numbers of family bands, led by siblings or spouses. This time, we have another stellar example, in this case a pair of spouses who had separate careers for several years, and married before they started working together as a group. 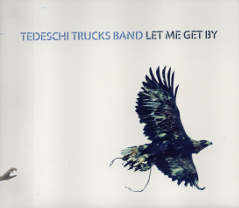 It’s the Tedeschi Trucks Band, and their new recording is called Let Me Get By. Derek Trucks is the nephew of Allman Brothers Band drummer Butch Trucks, and turned out to be something of a guitar prodigy, winning a lot of attention while still in his teens. After being in a number of groups, including Frogwings, the younger Trucks started his own band, and was eventually invited to join the Allman Brothers Band. For over a decade, he was dividing his time between his own projects and the Allman Brothers. Susan Tedeschi was also something of a musical prodigy. At six years old, she was an understudy in a Broadway musical, and was in bands since age 13. With both Tedeschi and Trucks leading their own groups, crisscrossing the country and often playing at the same venue, they met in 1999 when Ms. Tedeschi’s band was opening for the Allman Brothers, with Trucks as a member. They married in 2001, but continued to maintain their own respective bands, both individually winning kudos. They would sometimes play on each others’ records and concerts, and had a kind of occasional joint project called Soul Stew Revival which was mainly a cover band. But it was not not until nine years later, in 2010, that they decided to work together in a single band in earnest, putting their respective individual groups on hiatus and assembling a jointly-led ensemble doing original material. They played a number of festivals before they collaborated on their first joint album, Revelator, which we featured on this series in 2011, and which won the 2012 Grammy Award for best blues album. They followed that with a live album Everybody’s Talkin’, the next year, and in 2013, issued another worthwhile release Made Up Mind. Now they are out with their third studio recording called Let Me Get Buy, and the band continues their direction of as much soul and R&B as the blues. According to the CD’s unusually detailed liner notes, the recording was done over an extended time with some recording and then touring and back to recording. They worked out of a studio they set up in their Jacksonville, Florida, home, using a bunch of vintage analog equipment. The result is an album that will not disappoint the group’s growing number of fans. They continue their emphasis on the soulful side of the music more than straight blues. Ms. Tedeschi is a first rate singer whose style and sound is similar to that of Bonnie Raitt. Interestingly on this album, Ms. Tedeschi does not play that much guitar. She’s a great player, but most this album focuses on her vocals, so she plays guitar on only a few tracks. Another change is that the group’s lyricist, Mike Mattison is also heard on lead vocals on a couple of the tunes. The band remains a large one with a regular horn section and background singers. Like the Allman Brothers, Tedeschi Trucks Band has two drummers. The one change from last time is the replacement of bassist Otiel Burbridge, who took a hiatus to raise a family, with Tim Lefebvre from the jazz-rock fusion world. Another regular guest on the recording is Doyle Bramhall II, who has worked with the band previously. The compositions on the album are all originals, and all co-written by Derek Trucks, sometimes with Ms. Tedeschi, and sometimes with other collaborators in the band, and with Mattison or Bramhall. Let Me Get By, the new fourth album by the Tedeschi Trucks band is another fine record highlighting the band’s soulful bluesy sound. The group has been performing together intensely for the last five years, spending over 200 days on the road in 2014 as they were gearing up to do this album. So it’s musically tight and with the band road-tested and playing very well as a unit. The various members have opportunities to their respective make contributions to the album. It’s also a large group but it rarely gets unwieldy. The songs are well-written and embody classic blues and soul influence, and there is little concession to current musical fads. Our grade for sound quality is a B minus. In the past, The band had worked with producer and mix engineer Jim Scott, who is known for his excellent rock mixes. This, being more of a do-it yourself project decidedly falls short on the sonic end with a dull, not very warm sound that is of course, cranked up and compressed for loudness in a way that takes much of the life out of the music. The Tedeschi Trucks band, with the combined stylistic contributions of the two spouses, have found the sweet spot between blues, soul and Southern rock. This new album continues their winning combination.